This image shows a few of the past changes in the Mount Pleasant Industrial area. It started life as a residential neighbourhood, and there are a few vestiges of that residential past still to be found today; some still lived in, and others adapted to a commercial role. The gradual loss of the original houses has taken many years; the house on the right dated back to 1910, and was only replaced in 1967 with a single storey building. We can date the image quite closely, as the building on the left was only completed in 1963, so the picture must have been shot within a year on either side of 1965. When the house was first occupied in 1910, Joseph H Brooks, a horse dealer lived here, and a year later he added a new stables to the property, although his sales stables were located at 1025 Main Street. In 1901 he was in the Yukon, living in the Atlin District with his wife, Anna, and their three children. At that time he was listed as a ‘freighter’. He had only been there a couple of years; his two year old son, Egbert, was born in the Yukon, but his older sons, one only a year older than his younger brother, had been born in the US. A daughter, Hazel was also born in the Yukon. Joseph and Annie (as she was shown in 1911) were both originally from Ontario. Joseph stayed in the house for several years, switching his occupation to coal dealer. The last year we can trace Joseph in Vancouver is in 1920, but his son Egbert, a boilermaker was still living in a different house on the same block of West 8th Avenue in 1921 with his wife and baby son. There’s some information about Joseph, and how he died, on a Yukon website. “Mr. Brooks came to Skagway in 1897 from Vancouver. He was a merchant and wrangler. His company “J.H. Brooks, Packer and Freight” was headquartered in the St. James Hotel. He is famous for taking 15 mules over the Chilkoot Pass and later took 335 mules over. He claimed that he and a Mr. Turner had first blazed the trail. He returned to Skagway in 1934 to collect information for his book and died on this day, July 13, 1934 on the Chilkoot Trail. He was born about 1867 and was about 67 years old when he died and was buried in the Pioneer Cemetery.” We can’t find Mr. Brooks in Vancouver before he went to Yukon, so suspect that may not be accurate, or that he was here only very briefly. It’s easy to see how street trees in the industrial area have altered the character of the street – there were very few, despite the residential origins of the neighbourhood, in the 1960s. Today the 1967 building is home to 33 Acres Brewing, but many of the existing structures are now getting replaced as new zoning has allowed office space to be added, as long as an industrial component is retained. When this apartment building was first completed it was known as the Mount Stephen Block. The architecture features the trademark brick patterning used by Townsend & Townsend, with one of the most flamboyant pressed metal cornice designs ever built in the city. ‘Exploring Vancouver also noted that ‘Two immodest female figures energetically support the heavy pediment’. The owner, and builder of the $60,000 project on the corner of Quebec St was W D Muir. We’ve seen a number of the Townsend’s other projects in the city. Many had the Argyle checker pattern in red, on a buff background. They used the same design on warehouses and apartments throughout the city. Although published biographies suggest they were brothers, our research suggests they were father and son, probably from Manchester. They were only in the city from 1909 to 1913, but managed to design buildings worth over $800,000. W D Muir was initially a grocer in Mount Pleasant; his premises were close to the flatiron where Main and Kingsway meet at 8th Avenue and he was a pioneer, establishing his grocery and bakery around 1896. He dropped the grocery, not only producing thousands of loaves, but in 1903 patenting the oven he used to bake them. In 1904 the ‘Mount Pleasant Advocate’ announced that he had added another oven, and could now turn out over 1,000 loaves of bread in an hour. 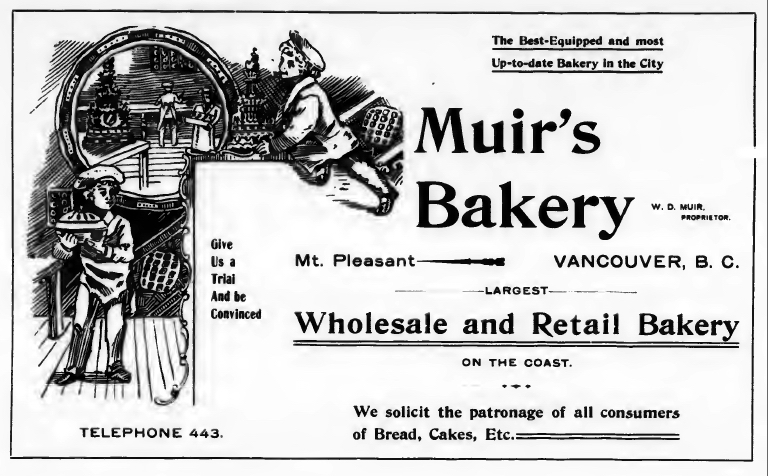 In 1905, when flour prices increased by $1 a barrel, W D Muir announced that he had $3,000 of flour on hand, and so could continue to feed Vancouver for a while longer without raising prices. In 1908 Wiliam is already listed as retired; he had sold the bakery business a year or two earlier to Hanbury Evans & Co. In 1909 he sold the large brick ‘Muir Block’ on the corner of Westminster (Main) and 8th, and he obtained the permit to build this apartment block in 1911, with completion a year later. The 1901 census tells us Mr Muir was from Quebec, born in 1856, while his wife Jane was from Ontario and a year younger. Their six year old son, Thomas, had been born in British Columbia. The household was large – there were seven lodgers, two who presumably worked for William as they were bakers, and a domestic servant. Duncan Muir was one of the lodgers, aged 21, a teamster (as were two others). By 1911 he’s shown born in 1854, and while Jane is a year younger her birth date is shown as 1850, showing census clerks couldn’t necessarily calculate accurately. William is shown as retired, living on income (presumably from selling his business, and a little later from rent). Their domestic was shown as Florence Muir, who was 28, and James and Jennie Muir, William’s niece and nephew were also living in the family. Jennie was aged 14, but James was 53 and working in a bakery as a stableman. The Mount Stephen Apaertments switched at some point in the 1950s to be an ‘apartment hotel and rooms’. It subsequently reverted to being a rental building that by 1979 was run down. The landlord of the day looked to add a massive rent increase, and the tenants fought it. With Federal financial support they formed a co-op and bought and renovated the building in 1980. The co-op later purchased the lot next door to add a yard, garden and parking space. With their new name, the Quebec Manor Co-op continues to offer 32 affordable rental apartments.